STORRS- Randy Edsall enters the second year of his second stint as UConn coach with an inexperienced team and an impatient fan base that has endured seven consecutive losing seasons. The Huskies, who are coming off back-to-back 3-9 campaigns, have just 10 seniors on their roster and only two returning starters on defense. That could be a bad combination for a team that begins the season on Aug. 30 by hosting UCF, last year's undefeated American Athletic Conference champion, before traveling to play Boise State on the blue turf in Idaho. Several freshmen and redshirt freshmen are competing for starting jobs with the Huskies and Edsall expects plenty of others will play. He said the NCAA's new rule that allows freshmen to see action in four games without losing their redshirt year should benefit his team. The Huskies have their fifth offensive coordinator in five seasons. John Dunn, who worked with Edsall at Maryland, replaces Rhett Lashlee, who left after one year to take the same job at SMU. Dunn runs a no-huddle spread offense similar to Lashlee, but said he expects it will take a while for the team to adjust to his system and terminology. 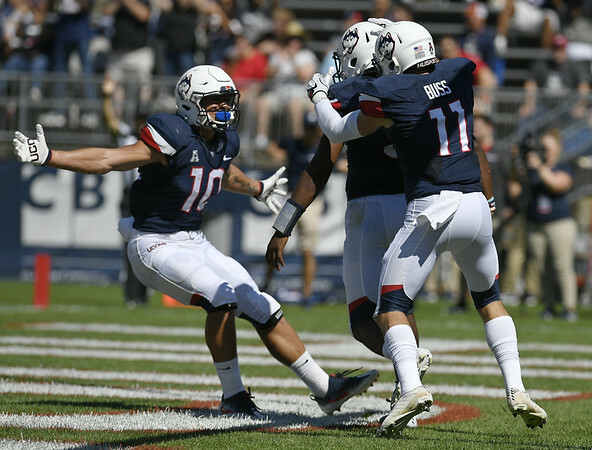 UConn has some returning talent in the skill positions, led by dual-threat senior quarterback David Pindell, a junior college transfer who started four games for the Huskies last year and played in seven. Connecticut began camp with an excess of running backs. That is no longer the case. Nate Hopkins, who led the group with seven touchdowns last season, quit the team this summer and plans to transfer. Junior Donevin O'Reilly, a former walk-on, was the leading contender to start before a season-ending knee injury on Monday. Kevin Mensah, who had 561 yards on 126 carries a year ago, is coming back from an academic suspension in the spring and has not spent much time this summer with the starters. Freshman Zavier Scott has that role for now, with Mensah, freshmen Dante Black and Khyon Gillespie also in the mix. “If we can have that one guy that can do it on all three downs, it's going to make us more efficient and more effective offensively,” Edsall said. Senior wide receiver Hergy Mayala has emerged as a leader on UConn's offense and perhaps its best player. Mayala led the Huskies a year ago with 43 receptions, 615 receiving yards and seven touchdown receptions. This year's group of tight ends includes an ultimate fighter, but that's not what Edsall wants. Junior Zordan Holman is a reserve whose goal is to be a world champion in mixed martial arts. He has already won several amateur world jiujitsu titles. His coach would rather he concentrate on football. “If we get him out of the jiujitsu mold and the MMA fighting mold, and more into a blocking tight end, there's a role for him,” Edsall said. For now he's expected to back up Tyler Davis and Aaron McLean, two former wide receivers. Posted in New Britain Herald, UConn on Friday, 17 August 2018 20:59. Updated: Friday, 17 August 2018 21:02.